I remember the first time that, in terms of the poem, words failed me – not my words or another’s words but words in general. I was attempting to describe a man speaking and, behind him, some deciduous trees in the distance. In my head, a forced perspective allowed the oaks and maples to look like cruciferous vegetables, maybe pieces of broccoli, which the talking head inadvertently chomped on as he spoke, or so it appeared. Within the context of the poem, I failed to describe this scene. With each attempt, the depiction quickly became over-explained and overanalyzed, and the description lacked any lyrical quality. I abandoned the poem. 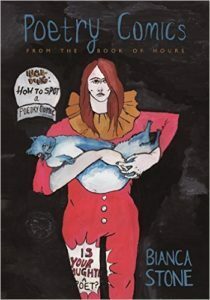 In fact, I’d forgotten about it entirely until reading Bianca Stone’s Poetry Comics: From the Book of Hours, a collection that’s something like a graphic narrative of poetry. To be specific, I remembered the vegetable attempt, if you will, while viewing Stone’s poetry-comic spread, “How It Is.” A sewing thread runs from desk to chair to chair to chair, and these linked images end at a tiny spool of thread. The angles of the chairs, however, are something I could never describe so poetically with words as Stone does with her ink and watercolor images. It’s the angle of the chairs, all empty, that I find most compelling: one is upright and facing away, another has been knocked over and lies flat on its back, and the last is facing toward both the reader and an illustration of a small group of people chatting. Of course, when writing, we can “show” using concrete details, but I’m convinced that these chairs, which appear both deserted and inviting, could never be shown in words in a way as captivating as Stone’s visual art. In the previous frame, a speech bubble reads, “Back then I was all-in. I pulled through like an upholstery needle.” This metaphor, especially the colloquialism, would be difficult to describe via images. But Stone isn’t only an expert in understanding what is better communicated with words versus illustrations. She creates a third canvas, too: the space for the conversations between the written word and the visual art. To the eye, there’s nothing domestic about the “upholstery needle” frame. The longhaired, rather androgynous human who speaks these sentences appears to have rushed out of a vehicle, a getaway car perhaps. The figure is shooting a handgun at the ground. The backdrop is a cityscape. The driver is holding a bottle of bourbon. The scene is urban and disorderly, dangerous even. Without the words, there would be no sign of domesticity within the frame. This third canvas, the dialogue between the visual art and the written word, is page shattering. This is the plane upon which Stone breaks barriers. In this period of late language, it can be difficult to explore issues of domesticity as leftover hints of female hysteria, albeit a dated concept, and saccharine sentimentality threaten to seep in. By juxtaposing the interior world, such as domestic cats, bottles of wine, and mental health issues, with the exterior world, such as voyeurs, postmodern flying machines, and crime scenes, Stone allows us to see the world in a new way, one that only a poetry comic might allow. Certainly, there are thought-provoking visuals (sans words) that could stand alone – such as a human diving into a bed with a bird-headed bipedal – and words that don’t necessarily need visual accompaniments, like “Little Napoleon ghosts / Swinging with their wine bottles / through the woods.” In fact, most of the pieces of Poetry Comics: From the Book of Hours hold their own. The book is one of showcases, layers, and complexities. The convergence of image and word, however, is the most captivating as, for example, a queue of deep space explorers reminisce: “You teach me” “how to stuff peppers” “with whatever we” “have in the cupboards.” But, I suppose you should see it to believe it. The genre of poetry comics grants endless opportunities to today’s poets. I think back to my own moment, my attempt at a poem containing a talking head and broccoli-like trees. I remember how I felt that the concept could be a surrealist painting, but, to me, it also felt poetic. I wanted it to be a moment in poetry, and, maybe, in light of the poetry comic, it could have been, but the notion wasn’t even on my radar. Now, however, thanks to pioneers like Bianca Stone, these realms are possibilities. Not merely the illustration of words, Stone’s poetry comics explore new yet primal literary landscapes, ones that brim with imagism, semiotics, and juxtaposition. More specifically, Stone is able to depict the everyday and even the domestic – those parts of our lives that make up most of our lives – with the gravitas that they deserve.